For the second consecutive year, a Spokane man’s motion-activated trail camera has captured an image of what appears to be a gray wolf in Mount Spokane State Park. Wolves are protected by state rules as endangered species in Washington. The photo gives more credence to sightings of wolves and wolf tracks that cross-country skiers have been reporting with more frequency for several years. However, Washington wolf biologists have not confirmed the sightings as anything more than wolves passing through the area. The most recent image was captured at 11:58 a.m. on March 30 by a trail cam. Hank Seipp said he just retrieved the images this week because he doesn’t ski and had to wait until mountain snow had melted. The camera was set up just outside of the downhill ski area, he said. Seipp, who put out a trail cam that photographed a darker wolf last summer near the Nordic skiing trails, also snapped recent photos of tracks in the mud and scats that also appear to be from a wolf. 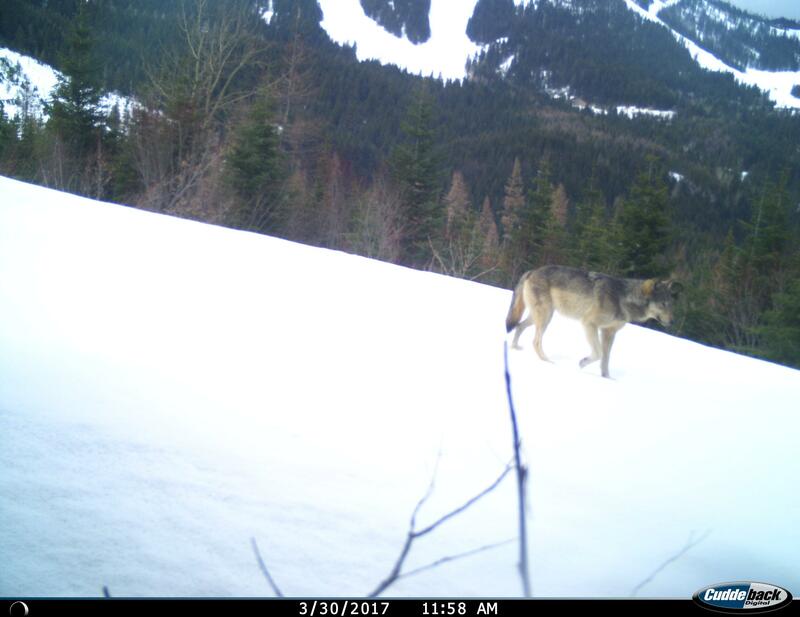 “We have not been able to confirm any pack activity at Mount Spokane despite the fact that we have been running cameras in that area for a couple of years now,” said Trent Roussin, Washington Department of Fish and Wildlife wolf biologist. “A radio-collared wolf that came through Mount Spokane a few years ago was from the Diamond Pack in Pend Oreille County,” said Madonna Luers, department spokeswoman. Roussin said the department is interested in any information the public can offer about wolf activity that might lead to confirmation of a new pack. Gray wolves were reintroduced to the Northern Rockies with releases in Yellowstone and central Idaho in 1995 and 1996. However, wolves already were moving in on their own from Canada, most notably into Glacier National Park. The wolves recolonizing Washington stem from wolves dispersing for more than a decade from Idaho, Montana, Oregon and Canada. The wolves are thriving, agency officials say, expanding on their population from a few scattered sightings approximately 13 years ago to 19 confirmed packs in Washington at the end of 2016. Wolves are protected by federal endangered species protections in the western two-thirds of Washington. Wolves in the eastern third of Washington, as well as in Idaho and Montana, have been federally declassified. However, wolves are protected statewide by Washington’s endangered species rules and managed by a citizen-drafted wolf management plan that establishes guidelines for their recovery and eventual declassification. Once a threshold of packs is achieved in regions across the state, wolves would be open to more management options, much as they are in Idaho, including the possibility of limited hunting. The bulk of Washington’s wolf packs currently are in the northeastern corner of the state. Hikers hitting the Mount Spokane trails – with their dogs on leash as park rules require – might consider carrying bear spray for the remote possibility of a wolf encounter, he said. Wolves have been known to be aggressive toward dogs. Confirmation of wolves in the Mount Spokane area serves as another warning for people living outside the park to be more proactive and protective of their pets and domestic animals, state wildlife managers say. Information can be found on the Washington Department of Fish and Wildlife website. “We have not had any confirmed wolf depredations around Mount Spokane, and really haven’t gotten many, if any, reports of any problems caused by wolves,” Roussin said.